Have you ever seen your GSD eating its own poop? Do not be stunned because GSDs tend to have this issue. It is not only instinctive but a common behavior seen in GSDs. There is nothing wrong with your dog; it is just the way nature has made them. Why Does a German Shepherd Eat Poop? Not only is this their instinctive behavior but there are sometimes reasons behind this behavior in GSDs. In the wild, these dogs live in a pack and stick together. When they don’t have food to eat, they pick up anything that they find and eat it. However, this reason for eating poop is not so common in them. This behavior is usually noticed in little pups that have just learned to chew and bite. They pick up tiny pieces of feces of other pups from the floor. This is a way of learning and exploring different things in their environment. Another scenario in which many GSDs are seen eating dung is when they have baby pups that are not able to clean themselves on their own. In such situations, a GS mother usually eats the feces of its little ones in order to keep the place clean. GSDs live in a pack, and there are positions for every member of the pack. The dominant dogs in the pack have the position of a leader and the submissive dogs eat their feces. 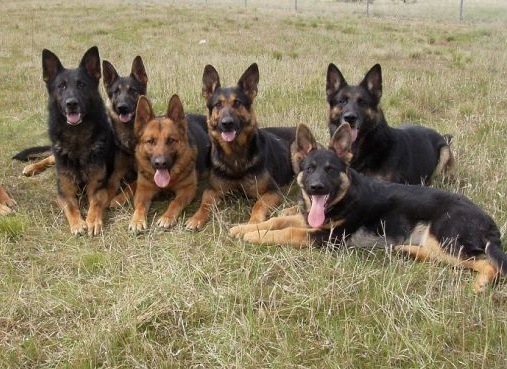 This usually happens when many GSDs are kept in a single place or the wild. Submissive dogs do so to show obedience and respect to the alpha dogs of the pack. If your GSD lives with other dogs and sees any of them eating poop, it will immediately pick this up as a habit. 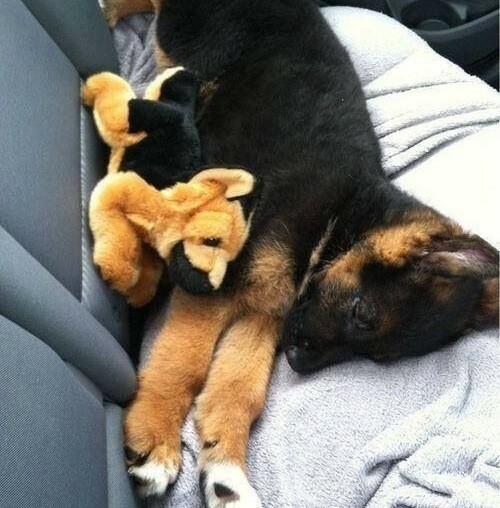 GSDs are extremely intelligent dogs, and that’s why they learn quickly. However, their clever mind can sometimes become a problem for the owners that see them eating their own feces. Many times a GSD will start eating its own dung if it is being punished badly by its owners. Some people like to punish their dogs the harsh way, which means they will put their dog’s nose/mouth in its poop if it misbehaves. Doing so will make your dog used to having the taste of its own feces and it will soon develop it as a habit that you will regret later. Remember, harsh punishments never work well with GSs. If your GSD is eating its own feces because it needs proper nutrition, there is no way you can stop it without taking help from your vet. Other than that you can adopt the following techniques to put a stop to this embarrassing habit of your dog. The best thing is to pick up your dog’s poop immediately and not leaving anything for it to feed on. If your GS is a pup, pick it up every time it approaches its dung. These actions will tell your dog that this behavior is not encouraged or approved. Moreover, by saying ‘no’ to your dog, you are maintaining your authority over it. Keep your dog under supervision when it is its poo time. Do not use chemical products to make this habit go away. Chemical products that are available in the market are not the best solution for the problem as they work for a few days and then leave side-effects. Chemicals have other effects like bad breath. If your GSD is eating poop from your cat’s litter box, make sure you keep it clean. Give your GSD a proper diet that includes digestive enzymes and probiotics. 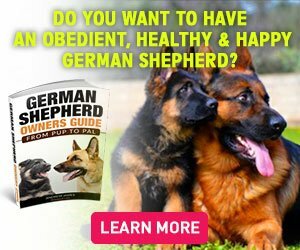 Make sure your German Shepherd is eating the best dog food available. Do not let your dog be bored because many GSDs will eat their own feces when bored. If your GSD is heading towards its feces, distract it using a toy or treat. This helps in creating a relation with ‘No poop-eating’ with a toy or treat. Sometimes dogs eat feces because they need enzymes to digest the food that they eat, called the modern dog feed. The modern dog food is made up of carbohydrates, proteins, and plant proteins. This food has a very little quantity of protein that a dog’s body requires. As a result, the dog feels the need to eat its own dung in order to digest its food. They eat their dung because they need proper nutrients for their body, and soon they develop this into a habit. This is a medical condition, and you will need to take your dog to the vet. A proper check-up from a professional will get you to the cause and help you get rid of the problem. Do not lash out on your dog out of disgust. Of course, no one likes to watch their GSDs eating their excreta. However, reacting negatively or hitting your dog will not help either. Get to the root of the problem and figure out an effective solution. If your dog is exhibiting coprophagic behavior, address the problem immediately. Talk to experienced people, and try to find a healthy solution like changing its diet to a more nutritious one. Do not hesitate to ask any GSD related problem and concerns. For more help on GSD related problems, you can sign-up for our newsletter and be a part of the best GSD forum.